Al Filreis and ModPo students at The Center for the Book gathering. Something unusual was going on at The Center for Book in San Francisco yesterday. In a museum devoted to the fine art of print book making, a group of 60 people, who’d never met before, gathered over their common interest in an online course. Modern & Contemporary American Poetry (better known as “ModPo”) is an introductory poetry course, taught online by Dr. Al Filreis. The winner of numerous teaching awards, Filreis is Director of the Center for Programs in Contemporary Writing and Faculty Director of the Kelly Writers House at University of Pennsylvania. In 2012 he introduced the ModPo course, through Coursera, and 42,000 students showed up. Since then, he and his graduate students have offered the course every year, refining and adjusting the ways they knit together that many students, spread all over the globe. Meet-ups like yesterday offer a perfect peek into the tools and methods they leverage to create the feeling of an intimate and personal learning experience with 42,000 people. Invitations prior to the event went out via Twitter (@ModPotPenn), Facebook and email (once you’ve enrolled in the course, you are a member of the ModPo community). There were about 60 people in attendance, with Al and his crew who video-recorded our meet-up (for later use in the ModPo 2016 course). Before they started taping, he invited each person there (all 60 of us) to share our name and connection to the course. What a range – high schoolers, high school teachers, physicists, office workers, software engineers, and retirees. There were two mother-daughter pairs and one dapper, older gent who came with his daughter. The daughter, Kate, took the course last year and “brought her father along, as she knew he would be interested.” When she introduced her Dad and I nearly fell off my chair – it was David Perlman. David Perlman of science journalism fame! For those of you who don’t know him, Perlman is a lauded science reporter for the SF Chronicle. He is now 94 years old and is still reporting. Turns out, before he took on the science beat, he covered the obscenity trial over Allen Ginsberg’s “Howl” in 1957. But back to the gathering. 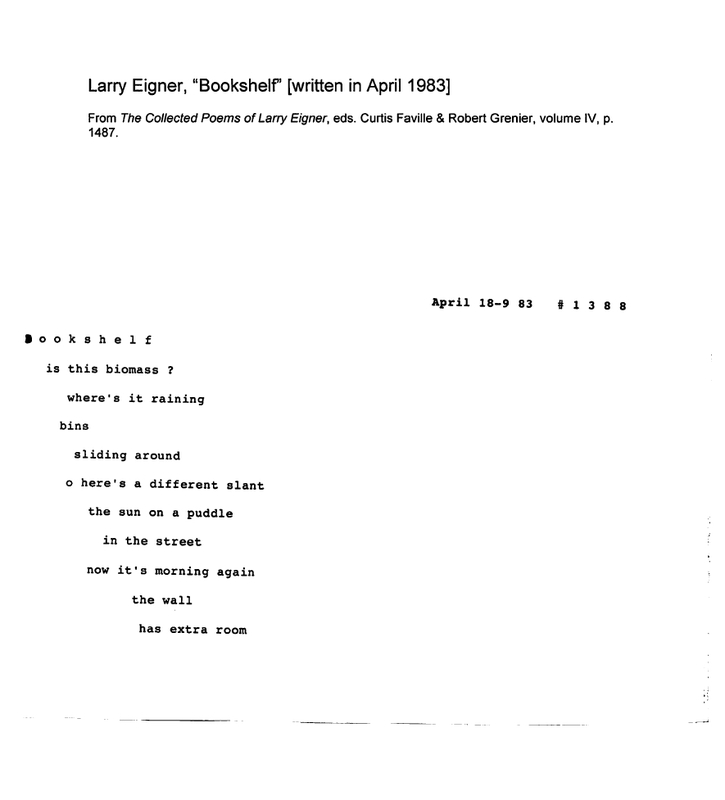 In advance of the event, Filreis had sent us all links to two poems – Joanne Kyger’s When I used to focus on the worries and Larry Eigner’s Bookshelf. We proceeded to do a “close read” of them both. This is a method that Filreis and his graduate students employ throughout the online course, delivered via video recorded sessions and, on occasion, live webcasts from the Kelly Writers House. He kicks it off with a little background on the poet and then reads the poem aloud. Then he assigns lines, words, or inflection points to particular people. Although I’ve watched this process many times, when taking the course myself, I was quite taken with the way it played out in this setting. Afterall, there were 60 of us and we aren’t graduate students! Here’s how it goes… “Becky, I’m going to ask you to talk about the first two lines in just a minute and then, after that, Carolyn, I’d like to hear what you have to say about the use of the pronoun ‘he’ in the third line, then we’ll circle over to Jack and see what he thinks of the way that stanza holds together. Ok, Becky – tell me what you think.” By doing it this way, Filreis controls the way it plays out. He also gives each person invited to share a few minutes to prepare, to think about it. Here’s a snippet, recorded on my iPhone, to give you a feel for his approach. Filreis clearly has a map to the poem, his own interpretation, in his head, and he nudges us through it. Line by line, word by word. When you are sharing your ideas, he’ll pull it out of you. “What about that phrase? And who does that remind you of? What does that line “there’s a different slant” make you think of?” He’ll often say something like, “that’s a really interesting interpretation – tell me more about that.” Turns out, he confessed to us, he learned this method of teaching from therapy. And once he said that, it all fell into place for me – of course. These ModPo sessions do feel amazingly similar a therapy session. But it’s not as though there is just one interpretation he’s attempting to press us all into. There were competing ideas, not everyone agreed – discussion ensued, just as it should be. It’s quite impressive to see how well this worked. Here we were, a big group of amateurs (some he knew, many he didn’t), and we moved our way through those two poems in the most satisfying manner. I had read them in advance, and liked them both, but I left the session with new insight and respect for both poets. Not one interpretation of them, but shades of meaning, insights into possibilities, and so much respect for the power of word choice, spacing, rhythm, and the nature of the poems. By the end of the session, we’d all offered our thoughts, shared ideas, and there was this frisson of enthusiasm, excitement, zest for the poems (and the poets) we’d just read. Something that could have never been achieved solo (at least for me). These close reading sessions work very well in the online course but I definitely had a richer appreciation for the process after seeing it in action face-to-face. When I enroll in ModPo ’16, I’ll have a much deeper understanding and connection to this pedagogical approach. It’s also clear that the course development team have really learned to leverage the platform and an array of tools to provide a well functioning sandbox for community. Community and connection feel alive and well in ModPo. And the rich tapestry of the ModPo membership only serves to deepen that feeling of connection. In attendance at the meet-up was a young woman from China who happened to be on vacation in San Francisco, got the word about the event, and showed up. Could that same strength of connection arise from a course in biochemistry or law? I hope so, but there’s no denying that poetry offers a unique doorway to the exploration of the individual, relationships, values, and the connections between us. Taking a moment here to recognize and revel in the myriad methods this course presses into service. Print and digital, synchronous and asynchronous, in person and virtual, listening and speaking, contemplating and sharing. That’s a key lesson we’re learning in this world of online education isn’t it? Hybrid works. The best of each approach, use the right tool for the job, no one right answer, blend your methods and make a custom concoction to fit the unique challenges and concepts of your material. Al Filreis and graduate students in a ModPo video. 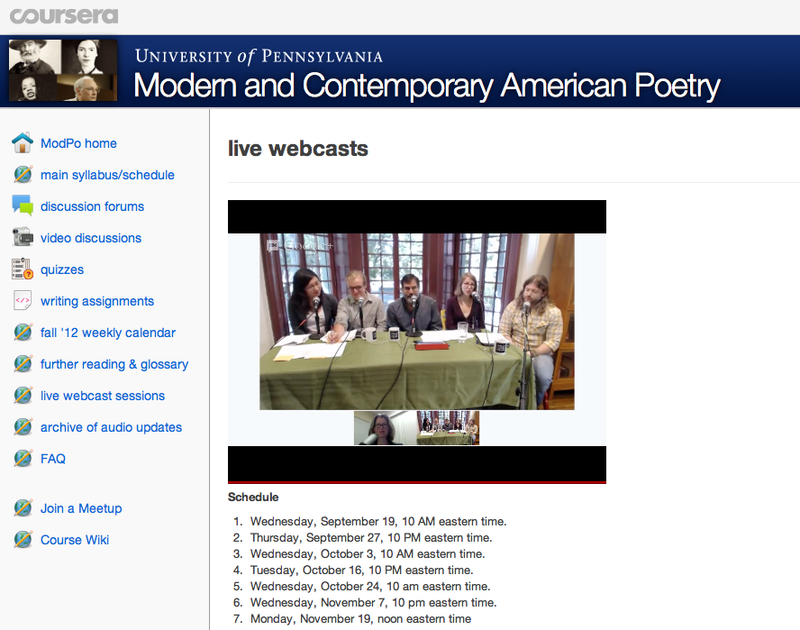 The Modern and Contemporary American Poetry MOOC has drawn to a close. Papers are in, last discussions have ended, and the organizers have surveyed the participants. Time for a little reflection on the experience. As background, I enrolled in ModPo – a massively open online course (MOOC) offered by Coursera and taught be Dr. Al Filreis (University of Pennsylvania) in the fall. Here is the blog entry I wrote at the start of the course. Overall, it was a positive experience. I learned a lot about American poetry. The content was rich, the course was extremely well-organized and executed, and the organizers made the most of participatory media tools they selected (video, discussion boards, Twitter, Google Hangouts, podcasts, and blogs) to draw us in and get us thinking. Here’s a (rather shaky, sorry) home video, shot by Al Filreis, at the end-of-course party held at the Kelly Writer House (where he is based) on campus at Penn. Apparently, participants who lived within driving distance came for the event to join Filreis and his graduate students to raise a glass and reflect on the course. Some real love here. So, that’s the good part. The not so good part? Well, first off, I didn’t finish the course. My bad – but that fact deserves some examination. Like many who enroll in these massive online courses, I fell by the wayside. I was struck by the figures mapped out in this bark from CogDog. In his post, Alan Levine recounts his experience taking a Social Network Analysis MOOC. Two tenths of a percent of those originally registered in his course completed it. I don’t know what the ModPo numbers are, but it’s probably close. From where I sit, the drop-off problem has two roots. First, there are no repercussions for the participant if s/he falls behind – I haven’t paid anything for the course, since I’m not working toward a degree I don’t have that fire in my belly, there’s no one there to notice if I don’t show up, and I don’t disappoint anyone (but me) when I don’t keep up. Of course, all of that is a personal thing with the learner. The more intractable problem, and the one that Alan focused on in his post, is that the course proceeds along at its own rate – not at my pace. There is no wiggle room for me and the rest of my life. My ModPo completion problem began with an extended trip in the middle of the ten-week course. Even though I had internet access on my trip, travel being what it is, I fell behind. And once I fell behind, it was a downward spiral. I couldn’t submit the assignments. The live synchronous sessions were impossible to follow without the readings. My pals in the Facebook group and on Twitter were referencing things I didn’t understand. As Alan points out, surely one of the primo affordances of online learning is the ability to flex time and make it work for busy lives. The ModPo-ers who submitted the four required writing assignments, peer reviews, and completed the quizzes will all receive a Coursera certificate of completion. There were no grades in this course – the focus was on effort, peer review, and discussion. I’m not sure how many certificates were awarded, but as soon as I find out, I’ll post it here. But here’s the other thing. The amount and level of participant interaction. What George Siemens refers to as a distinction between xMOOCs and cMOOCs. The former, xMOOCs, mimic the structure, cadence, and methods of a traditional course (lecture, quizzes, etc) whereas the later, the cMOOC, leverages the connectedness of the participants (see one of many meaty posts on George Siemen’s blog). 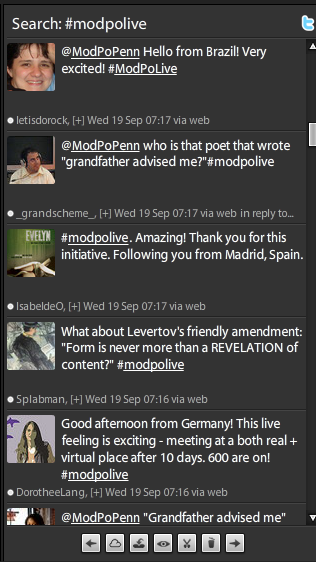 While the ModPo organizers did a very good job with video [particularly in the live synchronous sessions where the Twitter steam and an 800 number (!) were used to foster participation] and there were discussion boards (unwieldy and unmanageable) and assignments, the main elements of the course – where the action took place – were familiar territory for a college course: read, listen, watch. The most effective (for me) community elements sprung up on Facebook and with a friend who was also taking the course. That action sprouted up organically, outside of the course’s formal structure. What George Siemens (and others) encourage is a more connected experience. An emphasis on knowledge creation, rather than knowledge transmission. Courses that emphasize authentic assessment models where students demonstrate their understanding and skills through the products they produce and courses with distributed, multi-spaced interactions. ModPo was a fabulous beginning. I swoon over the impact that it will have as the incredible Al Filreis and his creative team evolve the pedagogy, leverage newer and better tools, and tap into the vision of a more connected model. It’s amazing, when you think on it, how far we’ve come. Afterall, MOOCs have only been a thing since 2008 – with the Siemens and Downs first MOOC – CCK08. And now we have many major universities offering MOOCs, two new companies (Coursera and Udacity in 2011) providing 100’s of MOOCS for all, and enough press coverage to choke a horse. I completely agree with Ryan Tracey on his well done blog post on the Future of MOOCs – MOOCs are here to stay and their impact on education will be felt by all.